Mrs. Henry, Finn's teacher, had told Sharon that Finn had been acting up a wee bit in class. He has been constantly ignoring us, especially Sharon, and generally being a pest in the house, but usually he seems to save his bad behaviour for home. We had a chat with Finn about how he's been behaving with us and at school and he was very upset, which is often the case when you try to talk to Finn and he perceives it as us giving him a row. It can be difficult to communicate with him at times. Anyway, Sharon took him and Zoe out for lunch, as we decided he needed some one-on-one time with us, and he had a great time in Toast, reprising his birthday breakfast from last September. 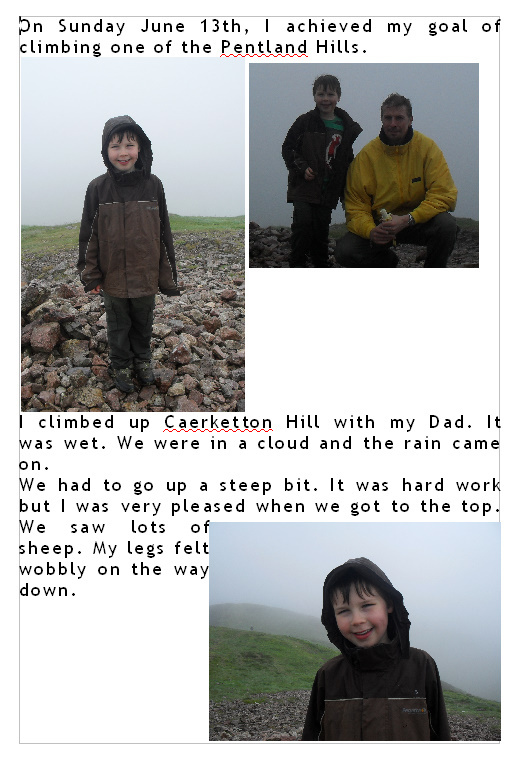 Previously, in his personal learning plan, I had set a goal for him of climbing one of the Pentland Hills. On the Sunday, despite it being rather wet and the cloud low, I took him for a walk from Swanston Golf Club up past the Village and on into the Pentland Hills Regional Park. Finn was a bit apprehensive about the sheep that crossed our path early on but we carried on and looped east around the top of Lothianburn golf course until we were above the Hillend ski slope. The cloud was descending by this stage and the way up on to the ridge was quite steep but despite the inclement conditions and a complaint about a sore heel, Finn persevered like the achiever I know he is until we got to the flatter ridge and a gentler ascent westwards to the summit of Caerketton Hill. He was beaming when we got to the cairn at the top. It may only have been a climb of around 900 feet from where we parked the car, but it was quite a long walk in tricky conditions, steep in places, and I was very proud of him for managing it. Finn phoned Sharon from the summit to say he'd got there but the cloud was preventing any possible sighting from the house far below. We carried on westwards and descended to the west of the scree, marvelling at the orienteers who were jogging their way down and across the hills. The sheep and the rain didn't bother us as we made our way back down to the car and tucked into a hearty lunch prepared by Sharon, who was also very proud of her boy for achieving his goal. The next day, Finn took the report below into school to show Mrs. Henry and she was so pleased he was presented with a Star Pupil Award at the Assembly, for achieving his personal goal. Finn said he felt proud. Mrs. Henry said she had a chat with Finn and thinks she's got the old Finn back.